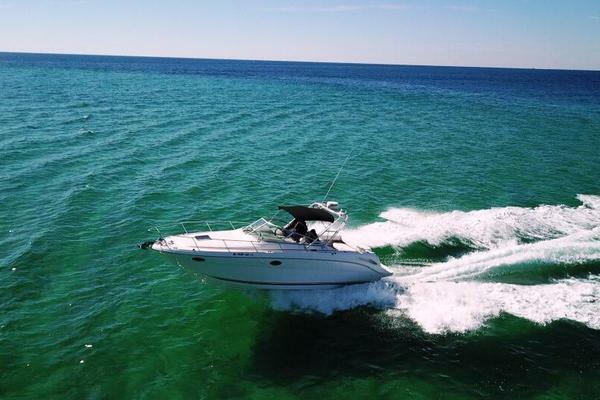 The Sea Ray 280 is a nice-looking cruiser with a curved windshield and integrated swim platform. With her wide beam, the interior is spacious with comfortable overnight accommodations for six. There is a V-berth seating arrangement forward with a filler cushion to make a double berth, the dinette converts by lowering the table and adding the filler cushion and the mid cabin stateroom is a double berth. Privacy curtains separate the three cabin areas. There is a full galley and a standup head with sink, Vacu-Flush head and shower. In the cockpit there is fore and aft facing seating aft with a large table separating them and a nice laid-back seating area along the port side. The helm seat is adjustable and offers a bolster and the helm visibility is excellent. The foredeck is easily accessed with steps built into the companionway door-leaving more helm space. Additional features include a transom garage for storage, extended swim platform and engine room access under the cockpit hatch. The 280 rides on a solid fiberglass deep V-hull with a flared bow and the 280 features a sleek profile with a forward-facing radar arch.Interior cherry wood and matching carpets and fabrics make the Sea Ray 280 appear much larger.Well cared for with limited long-term use, this 280 has under 150 original hours. Don’t miss this one, she is ready to go!Lift kept there is no bottom paint. On the hard currently while seller’s lift is repaired. No hurricane damage! United Yacht Sales New Jersey would love to guide you through a personal showing of this 28' Sea Ray 280 Sundancer 2004. 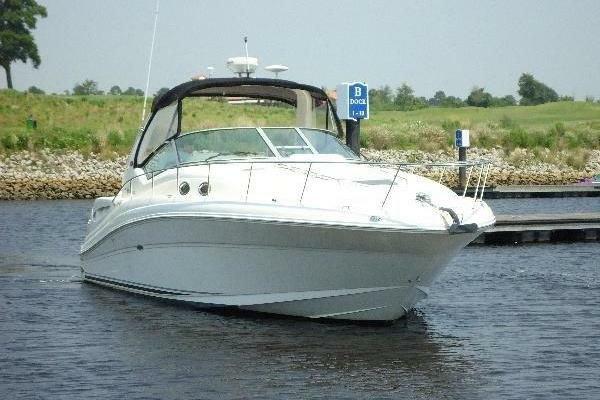 This yacht for sale is located in New Bern, North Carolina and priced at $39,000. For a showing please contact us by filling out the form on this page and we will get back to you shortly! Entering the cockpit by way of the integrated swim platform you will notice the cockpit on the 280 is made for relaxation. Along the transom are a settee facing forward and a settee facing aft. Between them is a high/low fiberglass table. On the starboard side and just behind the helm seat is the wet bar with sink and cold-water faucet. Forward and along the starboard side is the adjustable helm seat with thigh high bolster. The helm is well laid out with an adjustable steering wheel and all controls and gauges are within easy reach. Access to the bow is through the center windshield and steps molded into the companionway sliding door. Along the port side is a companion settee. Down a few steps you enter the roomy and well laid out main cabin. Behind the companionway steps is the aft cabin. The aft cabin features a double berth with a mirrored cabinet head board. Just before entry into the aft cabin is a locker with the entertainment center and storage for CDs. A privacy curtain separates the cabin from the main cabin. Forward and to starboard is the head with fiberglass vanity with built in sink, Vacu-Flush head and stainless-steel sink and faucet. Slightly forward and to starboard is the full galley. Ample solid surface countertops and storage spaces along with the matching sink, single burner electric stove top, and a microwave oven make the galley area an excellent food prep station. Across from the galley is the convertible dinette with fore and aft facing seats.Outboard storage cabinets and a cabinet with sliding doors make storing items easy. The dinette converts by lowering the table and adding the filler cushion. Forward and along the port side is a nice hanging locker. The forward area is a large “U” shaped seating area with matching pillows. The area can become a nice double berth by lowering the center table and adding the filler cushion. There are storage areas under each bottom cushion. An overhead hatch in the forward area features an Ocean Air shade and screen. A privacy curtain separates the forward lounge from the main cabin. Outboard sliding storage and the flat screen center and cabinet are to starboard. A privacy curtain separates the cabins. Located in the main cabin the compact galley enables the onboard chef to cook a wonderful onboard meal that will please the Captain and crew. The main electrical panel is located at the entry to the aft cabin. 30 Amp shore power cord, 50 ft. Mechanical: Engine room access is through a hatch in the cockpit making checks and maintenance a breeze.